Ten days ago the United States suffered the greatest mass shooting in our countries history. Sadly, horrific events like these are becoming more common. And it is also becoming more common that large scale criminal organizations operating outside the U.S. seize these moments to target our fears and anxieties that grow from these events. 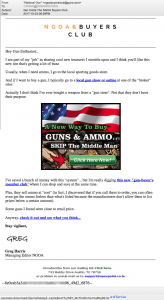 They send out malicious emails designed to prey upon our desire to be safe or, for some of us, to prey upon the fear that we will lose our second amendment rights. 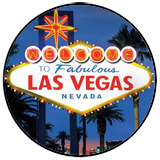 Look below in the Your Money column at the two malicious emails we found just days after the massacre in Los Vegas. These gangs are the scum of the earth. A Safer Alternative To Energize Your Home! Costco-Gift-Card, $50 Value, Participation Required..
Instantly Save Up To 40% Off Medicare Insurance With Fast, Easy And Free Quotes! Kidney Problems? What If You Only Had 5 Years To Live? Never Pay Full Price For Printer Ink Again! Save With Us Today. 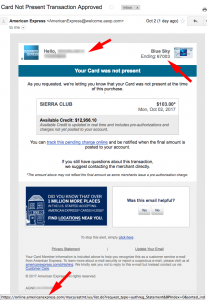 Pre-Qualify For Solar Today – Save Now! 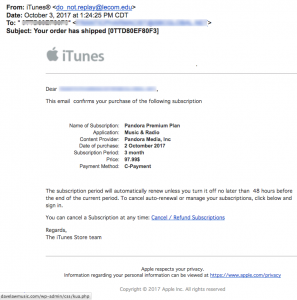 Two days later the same TDS reader sent us another phish targeting her. She can spot them! 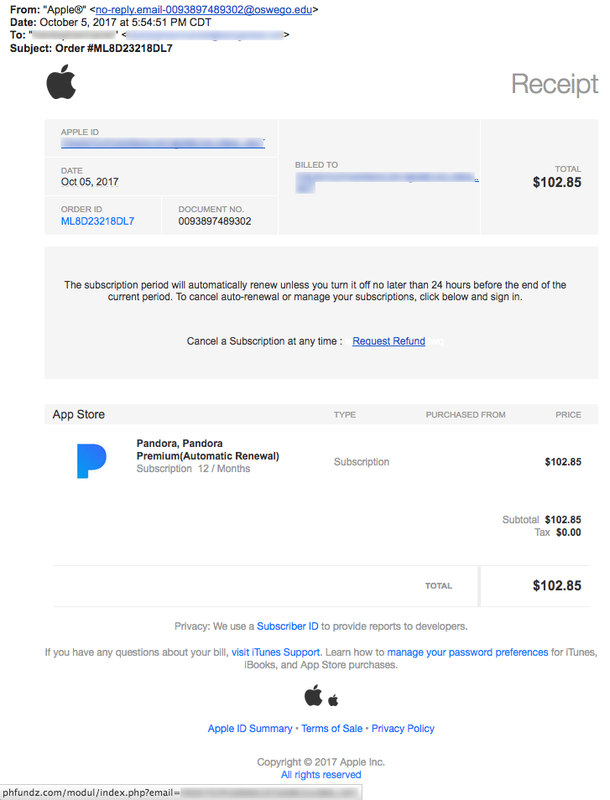 Again, notice that the email didn’t come from Apple.com and the link “Request Refund” doesn’t point to Apple.com! 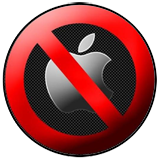 But if you were to visit the link, WHICH WE DO NOT RECOMMEND out of concern for getting a malware infection, you’ll see an Apple look-alike site inviting you to login. See below. 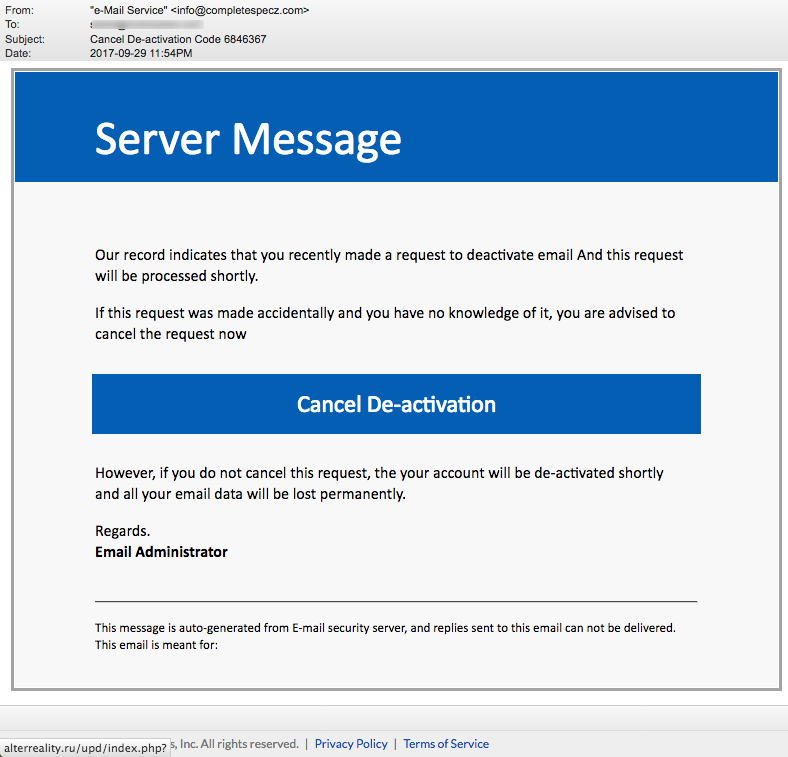 “Sever Message” “Our record indicates that you recently made a request to deactivate email And this request will be processed shortly.” Of course the email provides a link to “Cancel De-activation.” And that link points to a website in “.ru” –Russia. You know what to do. 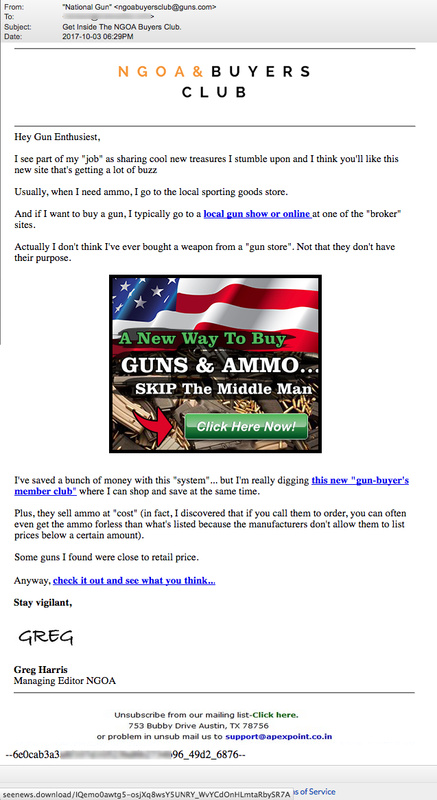 This next very long scam email was very professionally done. 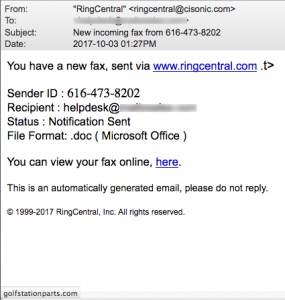 The from address was successfully spoofed to appear as though it came from the very real company ADT.com, but it did not. 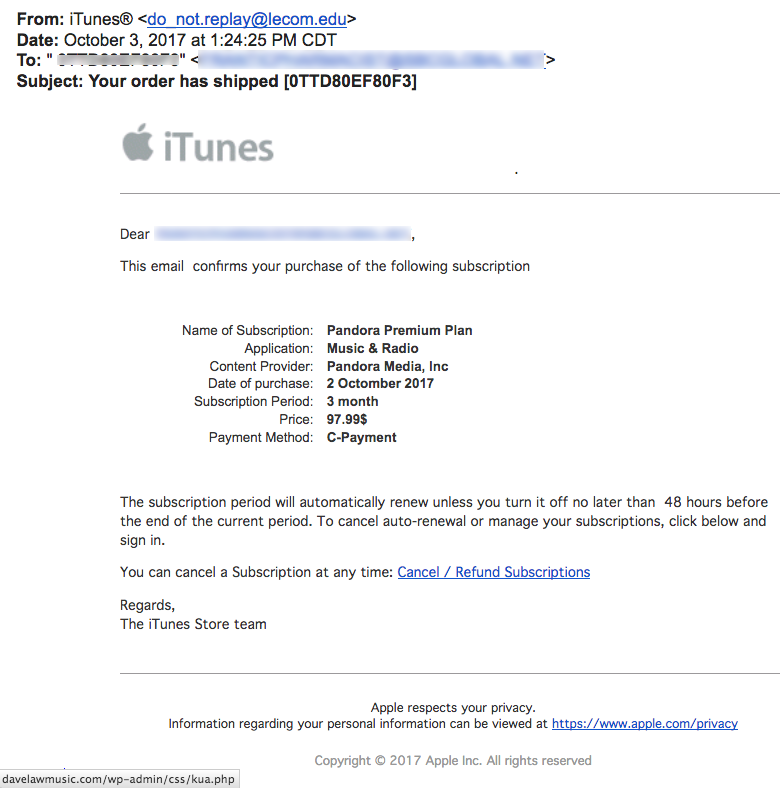 The email contains so many details and information to make it appear like a legitimate promotion. The English is flawless. And, not coincidentally, it comes just two days after the mass shooting in Las Vegas. There is only one detail that identifies this as suspicious. 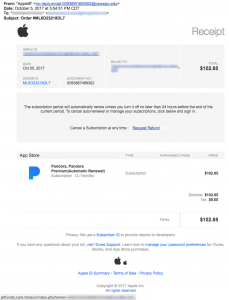 All links point to the strange domain newgift-DOT-bid (as revealed in the lower left corner of the email.) A WHOIS lookup reveals that this domain was registered on the same day the email was sent using a proxy company in Panama. 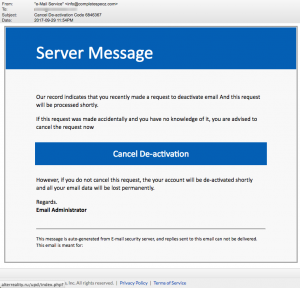 TOP STORY: Why Are These Emails Legitimate? 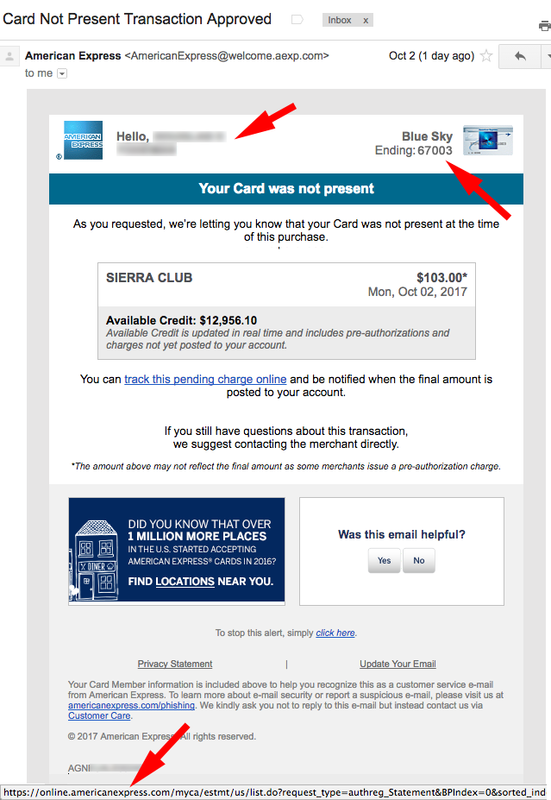 This next email begins with “Dear” and a correct full name to identify the recipient. 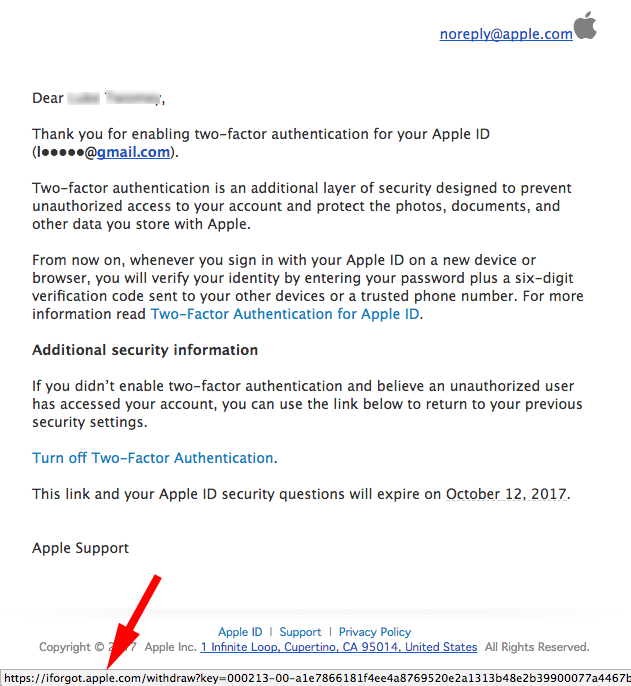 “Thank you for enabling two-factor authentication for your Apple ID.” A mouse-over of all links confirm that they point back to apple.com. And, once again, we find it reassuring that the link is a secure one using the secure protocol “httpS” to send information (as opposed to http, which is not secure.) Don’t be misled by the “iforgot” in the link. 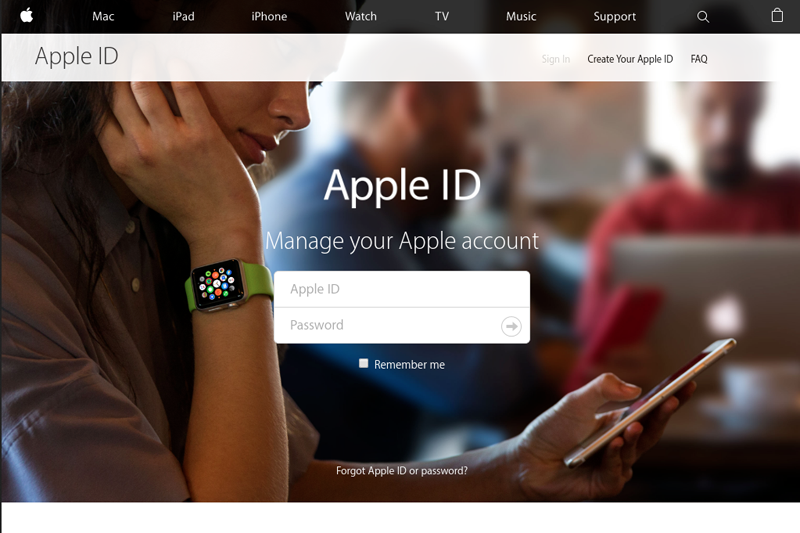 It is just a sub-domain that appears in front of apple.com. 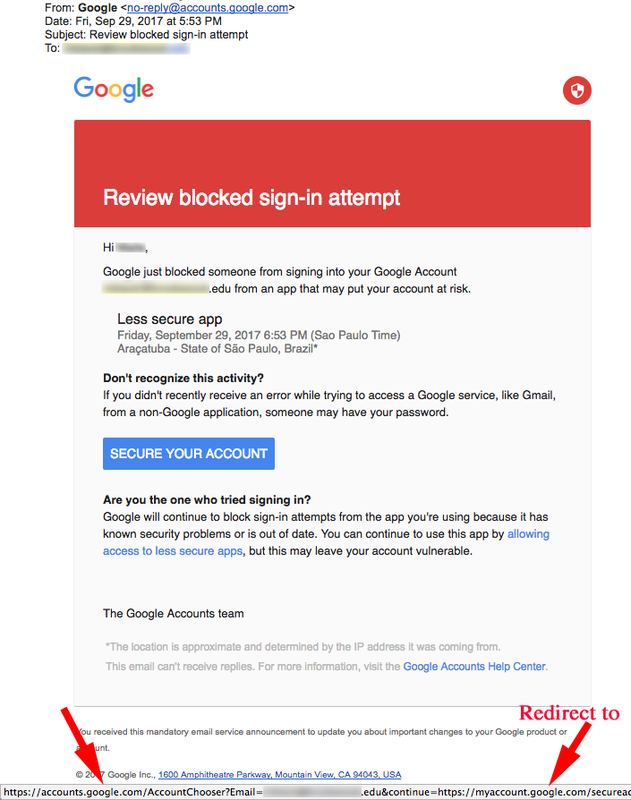 Finally, we offer this email from no-reply@accounts.google.com with the subject line “Review blocked sign-in attempt.” “Hi [name], Google just blocked someone from signing into your Google Account [full address] from an app that may put your account at risk.” Though this email is a bit disturbing, Google is informing you that it is doing the right thing by monitoring your account! 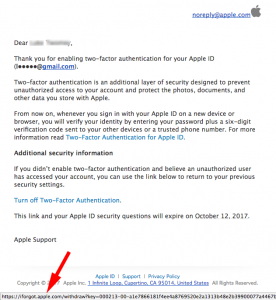 Criminals use modified emails that look nearly identical to this to drive you to phishing sites that steal your login credentials. But this is legitimate. A mouse-over of the link SECURE YOUR ACCOUNT shows that it points to https://accounts.google.com/ And though the link does contain a redirect (see arrow in bottom right), the redirect is also legitimate: https://myaccount.google.com/ In both cases, accounts and myaccount are subdomains separated by a period from the domain you want to see…. Google.com! If you found this article helpful, send it to a friend! 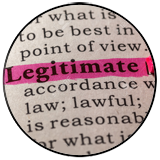 And visit our feature article titled Why is this Legitimate? 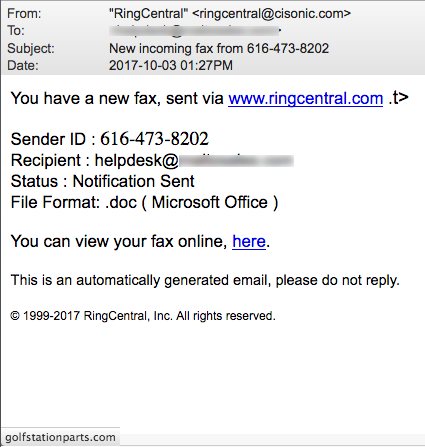 This email wants you to believe it came from RingCentral, a communications provider, but look carefully at the from address. And of course the link for “here” points to a website (golfstationparts-DOT-com) hosting malware according to VirusTotal.com. 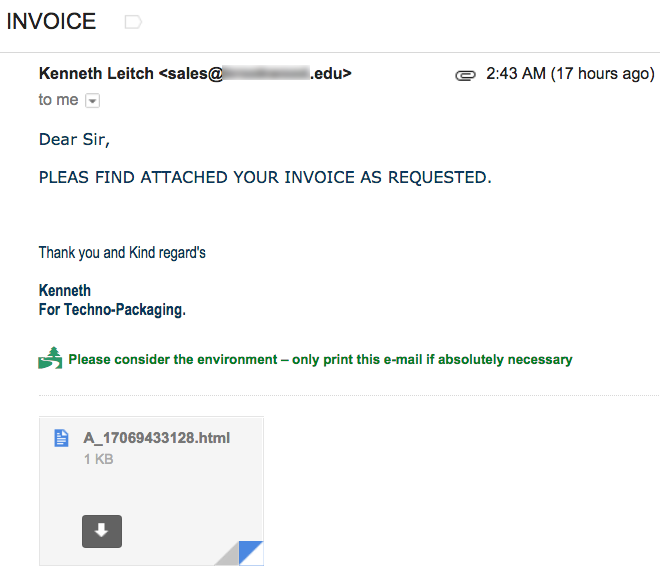 This next email about an attached invoice is clearly malicious. 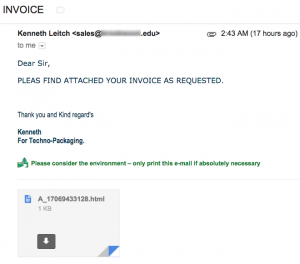 The “invoice” attached is actually an html web document containing web code. 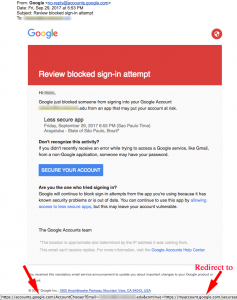 We cracked it open to discover that it actually seems to point the recipient to a Gmail login window which would make it a phishing scam. But there was also code in the file that we didn’t understand and had the potential to do more harm. At heart we are educators. 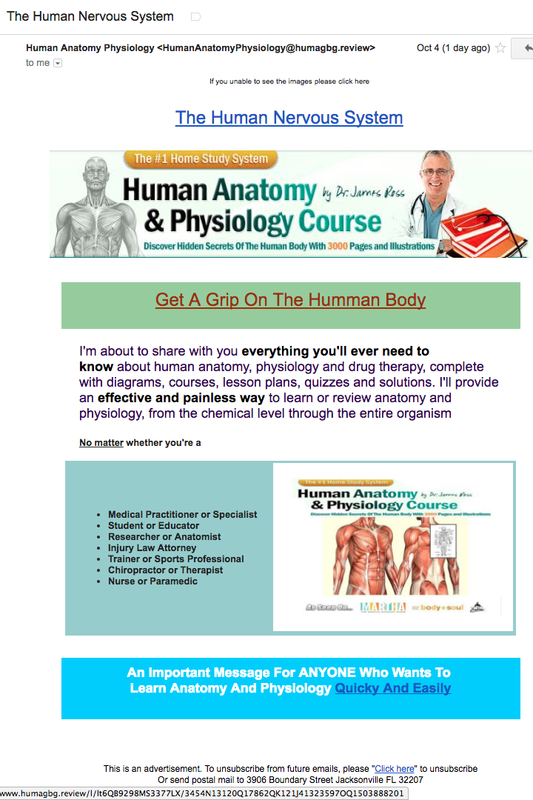 So we were very interested to see this email from Dr. James Ross, offering a course in Human Anatomy and Physiology. 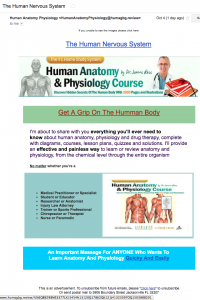 We can’t wait to learn what a Humman body is! And from a man who has so many international roots too! His domain, humagbg-DOT-review, was registered the day the email was sent by a woman in New York who uses a Russian email service (yandex.com) and is hosting the domain in Hamburg, Germany.